Play Angry birds online – As we all know that Angry Birds is one of the most popular paid game for the iPhone, Android and Nokia phones for quite some time now. 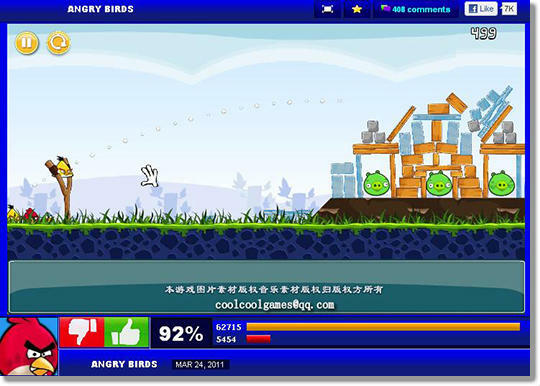 And after so many day I found a online flash version of Angry Birds which closely resembles the original version, so you can play your favorite smartphone game online. Angry Birds is certainly the best game that exist for latest smartphones . I am also one of “Angry Birds addict“. The game is flash version and seems ideal for those who want to test it before uploading it on the smartphone or on their Computer. Angry Birds is probably the most popular game of the moment. It has been downloaded more than 100 million times. Well now you can play a knock-off version online. Ever since Angry Birds became such a massive hit and more popular ever, there have been plenty of competitors who have tried to emulate the game’s style, but none have come this obnoxiously close to the original.